GREE has announced the release of Rage of the Immortals, its newest free-to-play RPG on Android devices. The game takes players to a land ruled by Hyperion, a corrupt organization which kidnaps humans and strips fighters’ of their superpowers. Players will work to become the “toughest fighter on the block,” combining units into a clan of fighters, each with unique skills and stats. In Rage of the Immortals, players can eventually recruit over 190 fighters, training and evolving their skills to create the best squad possible. Each fighter has unique elemental fighting skills, as well as different attack and defense stats. These fighters can be fused to create stronger units, and then taken into battle in both the single-player story mode or multiplayer. In single-player, gamers will explore a 3D map, unlocking new zones to fight in over time. In multiplayer, players can take their team into combat against others in a player-vs-player mode for better rewards. Other social features include the ability to add friends to squads, using their powers and special attacks during battle. Rage of the Immortals is the second game to be developed in partnership with IUGO, following Knights & Dragons. The game will be updated with new missions, zones and live events going forward. 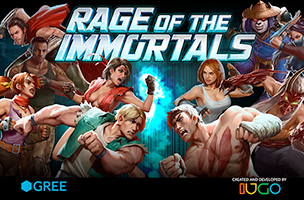 Rage of the Immortals is now available to download for free on Google Play. Check back soon to follow the game on AppData, our tracking platform for mobile and social apps and developers.